Also serving communities of Baker. There are 18 Assisted Living Facilities in the Baton Rouge area, with 17 in Baton Rouge and 1 nearby. The average cost of assisted living in Baton Rouge is $3,779 per month. This is higher than the national median of $3,346. To help you with your search, browse the 85 reviews below for assisted living facilities in Baton Rouge. On average, consumers rate assisted living in Baton Rouge 4.2 out of 5 stars. Better rated regions include Denham Springs with an average rating of 4.3 out of 5 stars. Caring.com has helped 12 families in Baton Rouge find high-quality senior care. To speak with one of our Family Advisors about assisted living options and costs in Baton Rouge, call (855) 863-8283. The capitol of Louisiana, Baton Rouge, is situated on the eastern bank of the Mississippi River. Baton Rouge is French for "The Red Stick," the name given to the city by French explorers. Seniors may want to find out the reason for this name and other historical facts dating back 300 years in the city's museums. In Baton Rouge, seniors will also find approximately 17 assisted living communities with another five in surrounding areas. In Baton Rouge and elsewhere in Louisiana, ALFs can range from homes that provide independent studio-type rooms with private bathrooms to two people to communities that do the same for dozens or hundreds of residents. Hot, humid south Louisiana weather may keep some individuals out of the city, but the year-round warm temperatures make Baton Rouge an ideal retirement location for those who enjoy spending time outdoors or want to escape snowy winters. Baton Rouge has a cost of living that's 4 percent lower than the national average, with utilities and transportation costs being especially low, making it a potentially good financial move for active seniors. Health care costs in Baton Rouge are 13 percent above national averages, though, which could be an important factor to consider for those with chronic illnesses. Louisiana doesn't tax Social Security benefits or other government benefit income, which means residents will save a bit on their annual state income tax. The state also provides a tax break on some private retirement income. Baton Rouge does have a fairly high crime rate, coming in higher than 86 percent of other U.S. cities. While living in a secure assisted living community with other residents and a 24-hour staff helps reduce your risks of being impacted by crime, there are nearly 15 daily crimes in the city for every 100,000 people, which may be a deterrent for some seniors. The Capitol Area Transit System is a bus system that services the greater Baton Rouge area. You can purchase daily, weekly, 15-day or monthly passes, and LSU football fans can purchase a season pass that gets them to every home game. Individuals who are unable to access the regular bus service because of a disability may be eligible for on-demand paratransit services. The Baton Rouge area is home to world-class medical facilities, including Baton Rough General Medical Center, Promise Hospital of Baton Rouge and Woman's Health, in the event of medical emergencies or illness. Assisted Living costs in Baton Rouge start around $3,779 per month on average, while the nationwide average cost of assisted living is $4,000 per month, according to the latest figures from Genworth’s Cost of Care Survey. It’s important to note that assisted living rates in Baton Rouge and the surrounding suburbs can vary widely based on factors such as location, the level of care needed, apartment size and the types of amenities offered at each community. 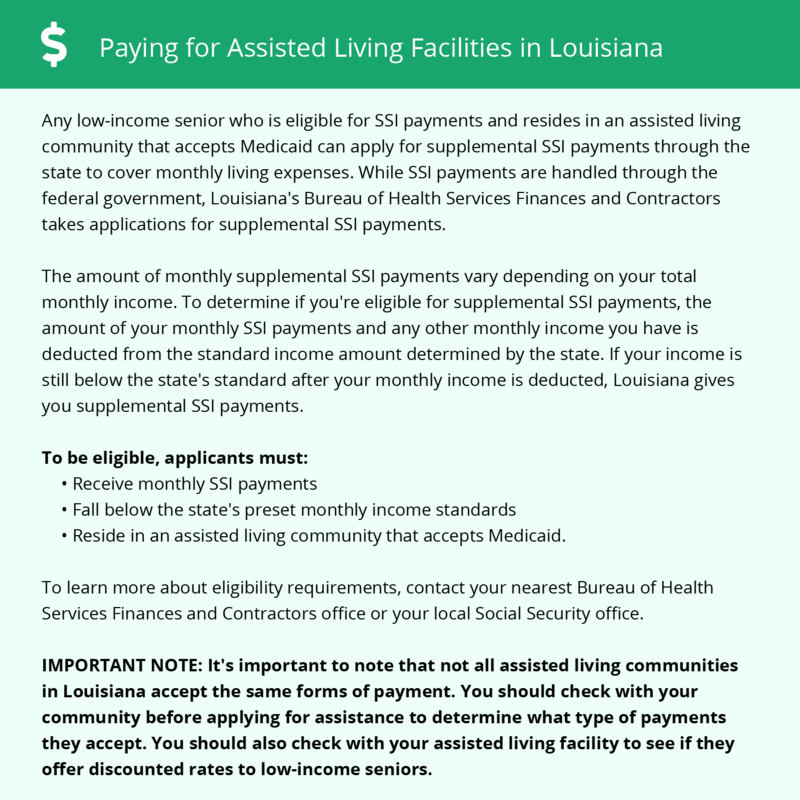 Louisiana residents may be able to receive some help in paying for assisted living services through the state's Community Choices Waiver program, though there is typically a long wait list. Baton Rouge and the surrounding area are home to numerous government agencies and non-profit organizations offering help for seniors searching for or currently residing in an assisted living community. These organizations can also provide assistance in a number of other eldercare services such as geriatric care management, elder law advice, estate planning, finding home care and health and wellness programs. To see a list of free assisted living resources in Baton Rouge, please visit our Assisted Living in Louisiana page. Baton Rouge-area assisted living communities must adhere to the comprehensive set of state laws and regulations that all assisted living communities in Louisiana are required to follow. Visit our Assisted Living in Louisiana page for more information about these laws.